John Berggruen Gallery is pleased to present its newest exhibition of recent paintings by Isca Greenfield-Sanders, Field at Hollow Road. The exhibition opens Thursday, November 4th, and will continue through Saturday, December 4th. An opening reception will be held on Thursday, November 4 from 5:30-7:30pm. 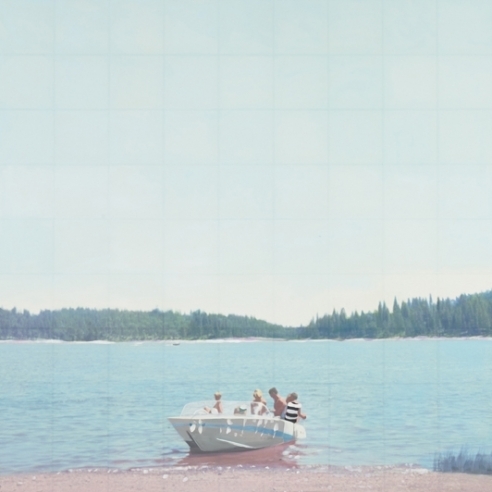 In her third solo exhibition at John Berggruen Gallery, Isca Greenfield-Sanders portrays familiar peopled landscapes based on vintage slides that the artist has culled from thrift stores and garage sales. The color palette of the images is altered in Photoshop, printed on rice paper tiles, and painted over in oil. The grid technique reveals her process of enlarging the slides while simultaneously creating smaller abstract paintings that comprise the figurative works. This series typifies Greenfield-Sanders’ ongoing interest in translating photography into a painting medium of her own; from a pervasive and accessible medium sometimes relegated to thrift shops to one that is treasured and revered. Several paintings included in the exhibition are from the Light Leaks series. In the words of the artist, “’The Light Leaks’ paintings memorialize the aesthetic of mistakes. They focus on the inaccuracies specific to film photography that have been eliminated by the use of digital media.” With these paintings, the artist is commenting not on the depicted figurative subject matter per se, but rather on the current state of photography itself. By scanning flawed vintage slides and manipulating them in Photoshop, Greenfield-Sanders juxtaposes the current dominance of digital photography with the relative extinction of film. Greenfield-Sanders currently lives and works in New York, and holds a dual degree in mathematics and painting from Brown University. Her first solo museum exhibition is currently on view at the Museum of Contemporary Art, Denver through January 9, 2011. Her work has been included in collections such as The Estée Lauder Corporation, New York, NY; The Solomon R. Guggenheim Museum, New York, NY; The Museum of Fine Arts, Houston, Texas; and The Museum Morsbroich, in Leverkusen, Germany. She has been the subject of articles in several publications including Artforum, ARTnews, Artnet Magazine, Harper’s Bazaar, The New Yorker, the New York Times, and Vanity Fair.